Description: As part of their Unique Brew Limited Edition Small Batch series, this beer is available only in Boston Rounds and only for a limited time. 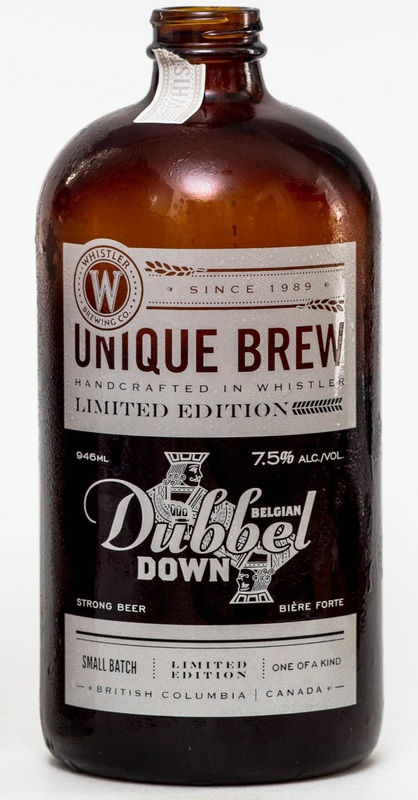 A Belgian-style Dubbel, this beer is fermented using Belgian yeasts to create a rich, dark, malt-forward ale. Tasting Notes: It’s been awhile since I’ve had anything from Whistler and I was pleasantly surprised to see some limited edition Boston Rounds at my local store. And this beer was good as Dubbels go, with plenty of the rich, sweet malt characteristics of this Belgian style. Brown sugar, molasses, and dark fruits combine with a slight tang and some alcoholic warmth that made me smile. Description: This seasonal brew from Dieu du Ciel is inspired by the German-style of wheat sour beer. Wheat malts which are allowed to ferment pre-boil accumulate lactic acid, which is then complemented with the addition of whole raspberries during the fermentation process – creating and acid and fruity summer beer. Tasting Notes: I was intrigued by the combination of a fruit-infused wheat with a sour twist. The summer fruit does a good job of balancing the acidity a little and providing some sharpness to the wheat malt base. But it was admittedly a bit on the tart side for my taste. There are plenty of notes in this beer, but the lactic acid tends to overpower them. Nevertheless, a good summer beer and another good offering from a great brewery. Description: In addition to being a summer seasonal and a resurrected style, this beer has the added distinction of being brewed using malts that were exclusively grown in Quebec. These include wheat, oats, and Pilsner malt, which are then bittered with the slightest hint of Noble Mittelfrüh hops. The end product is then combined with salt and coriander to create a true Gose. Tasting Notes: Gose’s – a style of beer native to Leipzig, Germany – are apparently making a comeback these days. And while this one was a bit mild for my taste, it did combine some rather interesting flavors and profiles. You get mild wheat malts mixed with a hint of salt, some sour flavor reminiscent of unsweetened lemonade, and just a touch of sharp coriander. Definitely an interesting brew and a great summer drinker! Description: This offering by Bad Tattoo is fashioned in the tradition of German Bocks, but with a Mexican twist. This involves dark malts that are fermented using lager yeast and at lower temperatures, but with a shorter fermentation that results in a crisp, dark lager reminiscent of a Mexican dark. Tasting Notes: I was very much reminded of two Mexican lagers when I drank this beer, the first being Negra Modelo and the second being León – a beer I thoroughly enjoyed while touring southern Mexico in 2006. A dark malt base, which has hints of cocoa, coffee, brown sugar, and a good mineral tang, manages to bridge the worlds of a bock with your basic dark lager, and in a way that is crisp and refreshing. Description: This is a Winter/Spring seasonal by Fernie, available between the months of January and March. And as the name suggests, it combines the brewing styles of a brown ale with an IPA. A dark malt base is combined with hop back and dry hopping methods to create a balance of toasted malts with hoppy bitterness. Tasting Notes: I was a little late to this brew, but was glad I caught up with it. A Brown IPA combines many aspects that are pleasing to the discerning beer-drinker. Notes of caramel, coffee, licorice, and roasted nuts combine with a hoppy profile that create a balanced but powerful brew. Description: This beer, who’s name is French for “Horn of the devil”, is a contemporary interpretation of the classic English India Pale Ale. Combining West Coast and North American IPA styles, the end result is a strong, hoppy offering with plenty of malt flavor and varied bitterness. Tasting Notes: This was definitely a good take on the North American/West Coast-style of IPA. A smooth malt base, with a mild tang and slight sweetness, are paired with notes of citrus, herbs and pine that create a balanced and strong brew. Another good offering from this Montreal-based brewery! Description: This imperial Bock was a collaboration between the Oregon-based Deschutes and the German Distelhauser breweries. In addition to Chocolate Wheat, Carared Malt, Pilsner, and Wheat Malt, the beer also features a good dose of Spelt Malt. It is then bittered using a combination of Bravo, US Tettnang, and Citra hops to achieve a rich, malt-forward ale. Tasting Notes: This brew definitely came as advertised – rich, malty, sweet, and quite strong. Though a bit overwhelming, it certainly did pack an interesting profile, with notes of banana, sugars, and spices. In this sense, it was quite reminiscent of other strong wheat bocks (Aventinus and Dumduminator) and some pretty strong notes of molasses.